Last time we talked about a laser printer was nearly two months ago when we reviewed the Kyocera ECOSYS FS-C8525MFP. That was quite an advanced laser printer. In fact, when it comes to gadgets, and printers are gadgets, most people tend to look for as many features as possible. Our question to you is why? Why do you XYZ features when all you need to do is print basic black and white documents 90 percent of the time? If you needed to do a lot of colour graphics printing or even photo printing, then we understand all those frills that Original Equipment Manufacturers (OEMs) so enjoy marketing. Otherwise, it doesn’t make any sense. 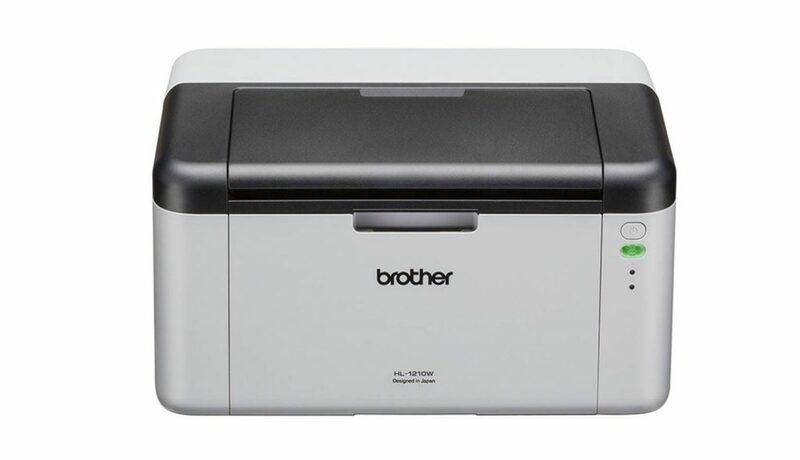 Take the subject of our attention today – the Brother HL-1210W. It is a very simple machine but it has still, debatably, seen more sales than the most advanced Brother laser printer. The point we’re trying to make is that there is merit in considering this entry level monochrome laser single function printer. Here’s our review as your catalyst. The biggest pull the Brother HL-1210W will have on any prospective buyer will be its cost. This is an incredibly affordable monochrome laser printer not only in terms of its initial cost but also in terms of its running costs, especially when you compare it to its competitors. You can get the Brother HL-1210W for around $60. The actual cost can be slightly higher or lower depending on where you buy it from and what discounts you get. The running costs are also decent but they vary on the basis of what type of cartridge you use. If you use cartridges manufactured by the OEM i.e. Brother, then you’ll end up paying around 7.4 cents for every page you print. In contrast, if you choose to use generic cartridges i.e. 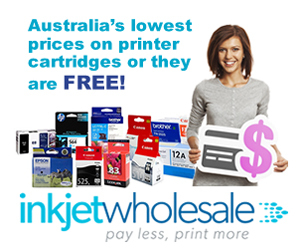 cartridges made by third parties, you get every page for only 6 cents, which translates into savings worth 1.4 cents on every print. All these savings are supplemented by the energy efficient nature of the device. On Standby mode, this device consumes a maximum of 40W while it requires only 380W while printing. For an entry level laser printer, the Brother HL-1210W also boasts of a very good print speed. While no match for business segment printers, the Small Office / Home Office (SOHO) segment will find its 20 pages per minute (ppm) to be speedy. You would think all these qualities come at the price of size but they don’t. 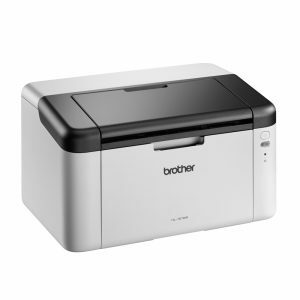 The Brother HL-1210W is as compact as it is excellent. It measures only about 189mm in height, 238mm in depth, and 340mm in width. The small size also means that it is lightweight, coming in at a mere 4 Kg. 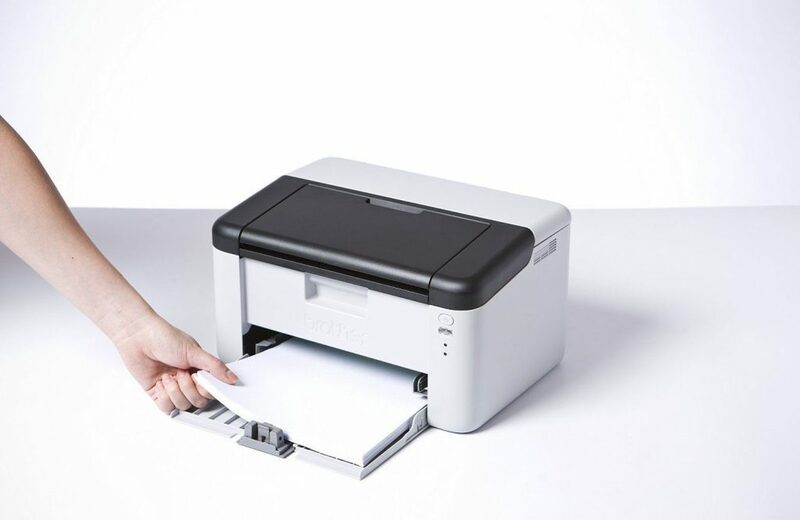 Laser printers are cheaper than inkjet printers to buy and to run both. The majority of laser printer buyers tend to buy them for this reason. In addition, because they’re so economical to run, most laser printers end up being used heavily. This is precisely why laser printers come with high paper handling capacities. Unfortunately, this isn’t the case with the Brother HL-1210W. At best, the paper handling capacity of the HL-1210W is average. It can hold up to 150 sheets at a time. Its maximum paper capacity is actually lower than the minimum monthly print volume recommended by the OEM itself. 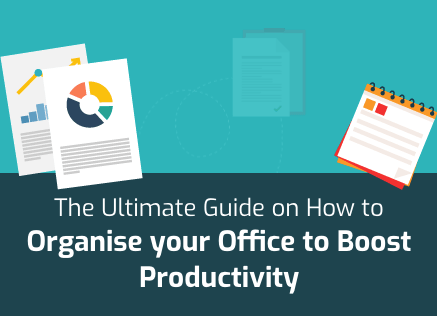 As per Brother, you should at least print about 250 sheets in a month, which means that you’ll have to manually add a new stack of sheets at least once a month. This seems like a pointless exercise to us since the spatial difference between 150 and 250 sheets isn’t a lot. Besides, the majority of entry level monochrome laser printers have more paper handling capacity than this. By the way, in case you wanted to know, the maximum you can print with this device in a month is 1,800 pages. To reach that number, you’ll have to add sheets to the printer no less than 12 times in a month! If you plan on doing a lot of printing, you’ll have to replace sheets fairly regularly, especially since there is no automatic duplexing feature. Effectively, Brother wants you to put in the leg work every month. Maybe they had your health in mind while they were designing this printer? They forgot, though, that no automatic duplexing also means zero savings on paper costs. The printer is affordable and that affordability is a result of the OEM cutting costs on the quality of building material. While the design of the device may be fine, it comes across as incredibly flimsy the moment you get your hands on it. There will be no rough handling this baby. You better align your employees on this one. Affordable means a lot of cost cutting on other features too. One of the casualties in this regard is mobile printing. The device doesn’t support it in the usual way. There is neither any support for Air Print or Google Cloud print but you can get limited access with the help of the OEM’s iPrint&Scan app. The device itself can be connected to computers through Wi-Fi, which is a great thing. USB 2.0 is another connectivity option that has been offered. Ethernet ports are absent so there is no putting the device on LAN. Output quality is one thing that we haven’t yet addressed in this review. That doesn’t mean that we don’t consider it important. It just means that we didn’t consider it to be a strength or weakness of the Brother HL-1210W. It is mediocre and very much satisfactory in our opinion. This is a monochrome laser printer that delivers exactly what you would expect from such a device. In fact, such is the consistency of output quality here that nothing stands out. Formally, the maximum resolution this device is capable of printing at is 600 x 600 dots per inch (dpi). 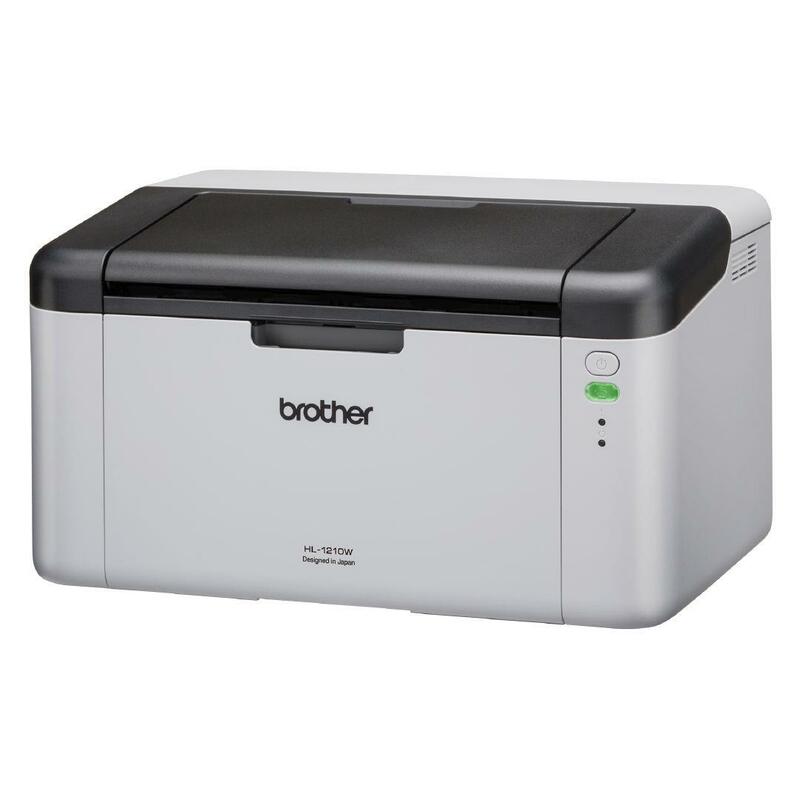 The Brother HL-1210W is also fairly quick to wake up in addition to boasting of 20 ppm as its print speed. From the ‘Ready’ mode, this device comes to life in less than 10 seconds, while it takes less than 28 seconds to become active from the ‘Sleep’ mode. A lot of this is because of the device’s print engine and its inbuilt memory. The inbuilt memory of the HL-1210W is to the tune of 32MB. If you’re planning to use the device directly without using a computer or mobile, you’ll have to forego your plans because there isn’t a control panel. There’s just the Power button along with three LED display lights – one orange representing an Error, one green representing power on mode, and the third representing WLAN connection. In terms of noise, this device doesn’t stand out either way. It is neither noisy nor silent. The noise levels are average. The OEM also offers a warranty of 12 months with their product, wherein the machine will be fixed by either the manufacturer or retailer. Don’t even bother with it. Every time I want to use this printer on any one of the three computers that I print from, I have to reinstall the driver. This printer is frustrating beyond belief. I have just reinstalled the driver again only this time it will happily print a Word document but not a pdf. I’m sick of the stupid thing – the next printer I buy will be a Samsung – they simply work. Thanks for your experience with this device. I’m sure everyone will find it useful. It sounds like a software compatibility issue to me. Would you like the opinion of our technical team? They’re very good with printers. This is my printer at home. Works very well. I use it with iPad and there are no issues. One thing I would like to know is, how long will the ink last? I print maybe up to five pages a month since I bought it in July 2017. Thanks! I bought this at your recommendation but regret as it doesn’t allow for 2-sided printing. I hate to waste paper regardless that the printer & ink is v affordable. I’m sorry to hear that. In my defence, I did mention that this device has no automatic duplexing in the post itself. I hope the other aspects of my review were accurate and satisfactory? – As another person has commented here, the configuration and drivers can be a nightmare. Particularly if you want to use the printer via Wifi instead of USB cable. If you need to use via Wifi, just FORGET this printer and look for another one. – The power supply cable is too short. – The printer is not provided with the corresponding USB cable: you have to find the compatible cable by yourself. This detail would be fine if the provider would notify it, but this is not the case.